The iPhone 6 and iPhone 6 Plus are iOS smartphones developed by Apple Inc. The devices are part of the iPhone series, and were released on September 19, 2014. The iPhone 6 series jointly serves as a successor to the iPhone 5S and iPhone 5C. The iPhone 6 series includes a number of major changes over its predecessor, including a streamlined design, models with larger 4.7-inch and 5.5-inch displays, a faster processor, upgraded cameras, improved LTE and Wi-Ficonnectivity, and support for a near-field communications-based mobile payments offering. Pre-orders of the iPhone 6 series exceeded 4 million within its first 24 hours of availability—an Apple record. More than 10 million iPhone 6 series devices were sold in the first three days, another Apple record. Critical reception of the iPhone 6 was generally positive. Many rumors surrounding the next iPhone centered around the device's size; the majority of iPhone models have used small, 3.5-inch displays—which are smaller than the larger screens used by flagship phones from competitors. The only major change in size for the iPhone series came with the iPhone 5(continued with the iPhone 5S and 5C), which featured a display that was taller, but the same width as prior models, measuring 4 inches diagonally. Following Apple's loss in smartphone market share to companies producing phones with larger displays (such as Samsung, whose popular Galaxy S4 model featured a 5-inch screen), reports as early as January 2014 suggested that Apple was preparing to launch new iPhone models with larger, 4.7-inch and 5.5-inch displays. Reports prior to its unveiling also speculated the possibility that Apple would use a new iPhone model to introduce a mobile payments platform using near-field communications—a technology that has been incorporated into many Android phones, but has a low adoption rate among users. The iPhone 6 and iPhone 6 Plus were officially unveiled during a press event at the Flint Center for Performing Arts in Cupertino, California on September 9, 2014. The event featured other major, previously-rumored product announcements by Apple alongside the new iPhone models, including the Apple Pay mobile payment platform, and the company's entry into the wearable computing market with the Apple Watch smartwatch. The iPhone 6 line was released on September 19, 2014; pre-orders began on September 12, 2014. In China, where the iPhone 5S and 5C were the first models in the iPhone series to be released in the country on the same day as their international launch, Apple notified local wireless carriers that it would be unable to release the iPhone 6 line in China on the 19th because there were "details which are not ready"; local media reported that the devices had not yet been approved by the Ministry of Industry and Information Technology, and earlier in the year, a news report by state broadcaster China Central Television alleged that iPhone devices were a threat to national security because iOS 7's "frequent locations" function could expose "state secrets". The design of the iPhone 6 line is influenced by that of the iPad Air, with a glass front that is curved around the edges of the display, and an aluminium rear that contains two plastic strips for the antenna. Both models come in gold, silver, and "space gray" finishes. The iPhone 6 has a thickness of 6.9 millimetres (0.69 cm), while the iPhone 6 Plus is 7.1 millimetres (0.71 cm) in thickness; both are thinner than the iPhone 5S, with the iPhone 6 being Apple's thinnest phone to date. The most significant changes to the iPhone 6 line are its displays; both branded as "Retina HD Display" and "ion-strengthened", the iPhone 6 display is 4.7 inches in size with a 16:9 resolution of 1334x750 (326 PPI, minus one row of pixels), while the iPhone 6 Plus includes a 5.5-inch 1920x1080 (1080p) display (401 PPI). To accommodate the larger physical size of the iPhone 6 line, the power button was moved to the side of the phone instead of the top to improve its accessibility. The iPhone 6 features a 1810 mAh battery, while the iPhone 6 Plus features a 2915 mAh battery. Unlike the previous model, the rear-facing camera is not flush with the rear of the device, and has a slight "bulge" around the lens.It has a Dual-core 1.4 GHz Cyclone Processor (ARM v8-based). Both models include an Apple A8 system-on-chip, and an M8 motion co-processor—an update of the M7 chip from the iPhone 5S. The main difference between the M8 and the original M7 coprocessor is that it also collects data from the barometer to measure altitude changes. Phil Schiller touted that the A8 chip would provide, in comparison to the 5S, a 25% increase in CPU performance, a 50% increase in graphics performance, and less heat output. Early hands-on reports suggested that the A8's GPU performance might indeed break away from previous generations doubling of performance at each yearly release, scoring 21204.26 in Basemark X compared to 20253.80, 10973.36 and 5034.75 on respectively the 5S, 5 and 4S. LTE support is expanded on the iPhone 6 line, with support for over 20 LTE bands (7 more than the iPhone 5S), up to 150 Mbps download speed, andVoLTE support. Wi-Fi performance has been improved with support for 802.11ac specifications, providing speeds up to 433 mbps—which is up to 3 times faster than 802.11n, along with Wi-Fi Calling support where available. The iPhone 6 line adds support for near-field communications (NFC), which is used exclusively for Apple Pay—a new mobile payments system which will allow users to store their credit cards in Passbook for use with online payments and retail purchases over NFC. NFC support is restricted to Apple Pay only, and cannot be used for any other purposes (such as sharing content with other iPhone users). While still 8 megapixels in size, the iPhone 6's rear-facing camera includes a new sensor which, like the camera in the iPhone 5S, has 1.5 micron pixels, an f/2.2 aperture lens, and the ability to shoot 1080p video at either 30 or 60 frames per second. The camera also includes phase detection autofocus. It can also record slow-motion video at either 120 or 240 frames per second. The iPhone 6 Plus camera is nearly identical, but also includes optical image stabilization. The front-facing camera was also updated with a new sensor and f/2.2 aperture, along with support for burst and HDR modes. The iPhone 6 line ships preloaded with iOS 8, the latest major release of the iOS platform. Apps are able to take advantage of the increased screen size in the iPhone 6 and 6 Plus to display more information on-screen; for example, the Mail app uses a dual-pane layout similar to its iPad version when the device is in landscape mode on the iPhone 6 Plus. As it uses an identical aspect ratio, apps designed for the iPhone 5 and 5S can be upscaled for use on the 6 and 6 Plus. To improve the usability of the devices' larger screens, an additional "Reachability" gesture was added; double-touching the Home button will slide the top half of the screen's contents down to the bottom half of the screen. This function allows users to reach buttons located near the top of the screen, such as a "Back" button in the top-left corner. Apple Inc. announced that within 24 hours of availability, over 4 million pre-orders of the iPhone 6 and 6 Plus were made, exceeding the supply available. 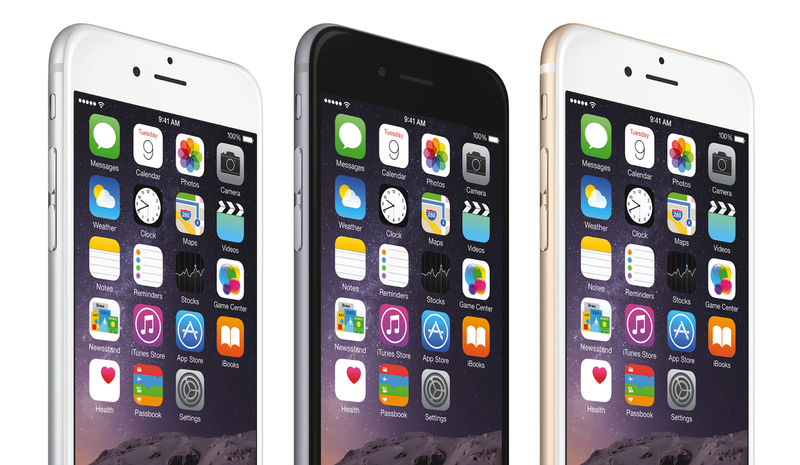 More than 10 million iPhone 6 series devices were sold in the first three days. Both iPhone 6 models have received generally positive reviews; TechRadar praised the iPhone 6's "brilliant" design, improved battery life over the 5S, iOS 8 for being "smarter and more intuitive than ever", along with the quality of its camera. However, the plastic antenna strips on the rear of the phone were criticized for resulting in poor aesthetics, the display for having lower resolution and pixel density in comparison to other recent smartphones - including those with the same physical screen size as the iPhone 6, such as the HTC One, and for not having a sufficient justification for its significantly higher price in comparison to similar devices running Android or Windows Phone. The Verge considered the iPhone 6 to be "simply and cleanly designed" in comparison to the 5S, noting that the phone still felt usable despite its larger size, but criticized the antenna plastic, the protruding camera lens (which prevents the device from sitting flat without a case), and the lack of additional optimization in the operating system for the bigger screen. Improvements such as performance, battery life, VoLTE support, and other tweaks were also noted. In conclusion, the iPhone 6 was considered "good, even great, but there’s little about it that’s truly ambitious or truly moving the needle. It’s just a refinement of a lot of existing ideas into a much more pleasant package." In regards to the 6 Plus, Engadget panned the device's design for feeling uncomfortable to hold and harder to grip in comparison to other devices such as the Galaxy Note 3 and LG G3, but praised its inclusion of optical image stabilization and slightly better battery life than the 6. Last updated on 13 October 2014 at 21:24.